My sweet little dirty faker. Everyone was all sweet and all about the “POOR MOOSH/POOR BABY/GET WELL SOON” comments. And I thank you for them, but I’m feeling a little guilty. You see, that sad pout up there? I had to ask her to make a sad face to go along with how pitiful her eye looked. Pink eye would never slow the moosh down. Dakota Fanning, watch your back. the moosh has skills. That is one amazing smirk! I was thoroughly convinced by the sad-faced post. Good work Moosh. she’s way cuter than Dakota Fanning. Dang, you tricked me. Moosh is entirely too good at making a sad face on command. Dang, you tricked me. Moosh is entirely too good at making a sad face on command. I’m betting she’ll be using that against you for years to come. Heheh. What a lil actress. Wait till she’s old enough to do it without prompting. Oy. Shecky is so MUCH about teh manufactured Drama! You crack me up woman. I so love that. Moosh rocks. and the Oscar goes to …..
Well, she’s cute no matter what…sad pout or not! You shouldn’t have said anything!! It looked very authentic. Maybe you should send this post in to the good people at the William Morris Talent Agency. Jen M’s last blog post..The Teacher is Coming! The Teacher is Coming! The moosh is a good faker! 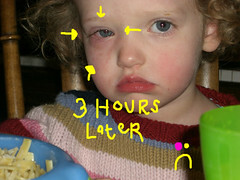 Good to know a little pink eye isn’t going to stop her from mooshing like the awesomely cute moosh she is! waaah! why can’t i see your pictures? i love to see moosh pictures, faking illness or otherwise. Dakota is getting older, ya know! They need another adorable little girl to take on every single role in the world for a girl under the age of thirteen. Sadie’s last blog post..News…and suggestions?? LOL! I’ve got some fakers here, too. It’s totally a girl thing, me thinks. What a cutie. Work that smirk girl! you dirty trashbag! i even left a “poor mommy” comment! Ah-ha-ha…that is so funny on so many levels. That picture looks 100% authentic. And one more plus about the Moosh is that she won’t have the awkward-looking teen years Dakota is having…yikes. 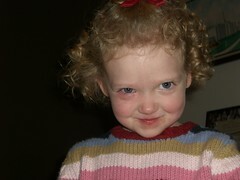 My oh my, that impish grin spells mischief. So cute though. I say what’s the fun of having children if you can’t make them do stuff for you. I think you are going to be trouble when she is older. How could you say no to a sweetie like that? You know when she can date she’s gonna be using that pouty face to score some serious bling. haha! That’s a great little smirk! The Moosh Daddy is in so much trouble. He doesn’t stand a chance against that face. She’ll get away with EVERYTHING. And you call yourself a journalist! Wait, no you don’t. Moosh has skills! Serious skills! Sign her up. Ooooo… you’re a sneaky motherfudger. Mary Beth’s last blog post..WITHOUT FURTHER ADO…..
Ha! I love her. Oh, and she’s TOTALLY cuter than Dakota Fanning.